Devastating hilarity! Alsø wik... mäni interesting furry animals. The silliness folds inward like a good tickle, the score is aces, and there are llamas and north Chilean guanacos (closely related to the llama). We'd very much like to meet Vic Rotter (see 2:58). 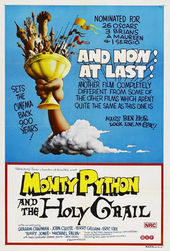 Terry Gilliam: One great thing about Python is we used to always play around with titles and text. Since there was nobody to stop us we just had fun. The first time we showed this to an audience they just couldn’t believe the world could be turned upside down… normally we watched films with people speaking Swedish with English titles but [not us], we did it backwards. This is as cheap as you can get when it comes to titles. When maintaining a very low production standard you can get away with murder. It’s always dangerous when you try to make good, proper films where you just cannot do these kind of jokes. Terry Jones: It’s very dangerous to look for significance in Python’s stuff; it just seemed like a silly idea to us. We realized we needed mock-heroic music but at that stage we couldn’t afford to record more music [for the titles] so the only thing I could do was go to a music library, DeWolfe in London, and I spent weeks sorting out bits of music. John Cleese: No one had ever mentioned to me about these hilarious credits that Michael Palin had written so I sat down expecting to see a perfectly normal set of credits at the front of the movie and there was all this wonderful Nordic stuff about moose. We first screened this at the Cannes Film Festival. 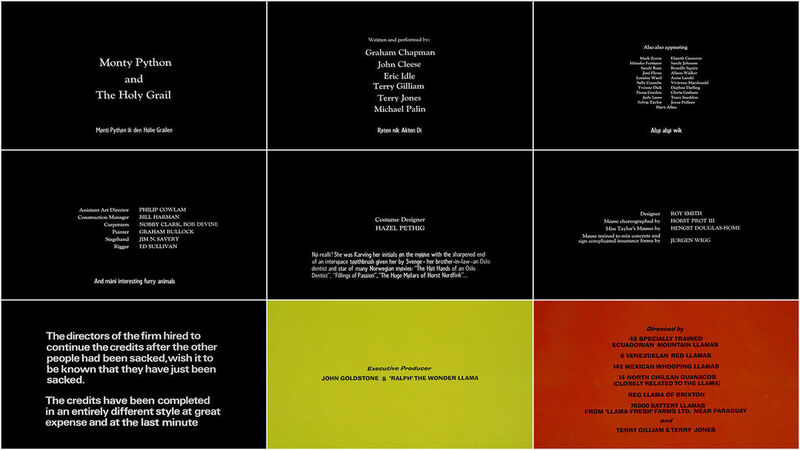 These subtitles got huge laughs and right at the end of [the sequence] the film stopped and everyone laughed and applauded. Then these men in French fireman uniforms with gold helmets came racing in and stopped the film and we had to go outside. It was a bomb scare. And everybody thought it was part of the film. It was perfectly timed because it was just after the credits so it didn’t interrupt anything. That was a good start.